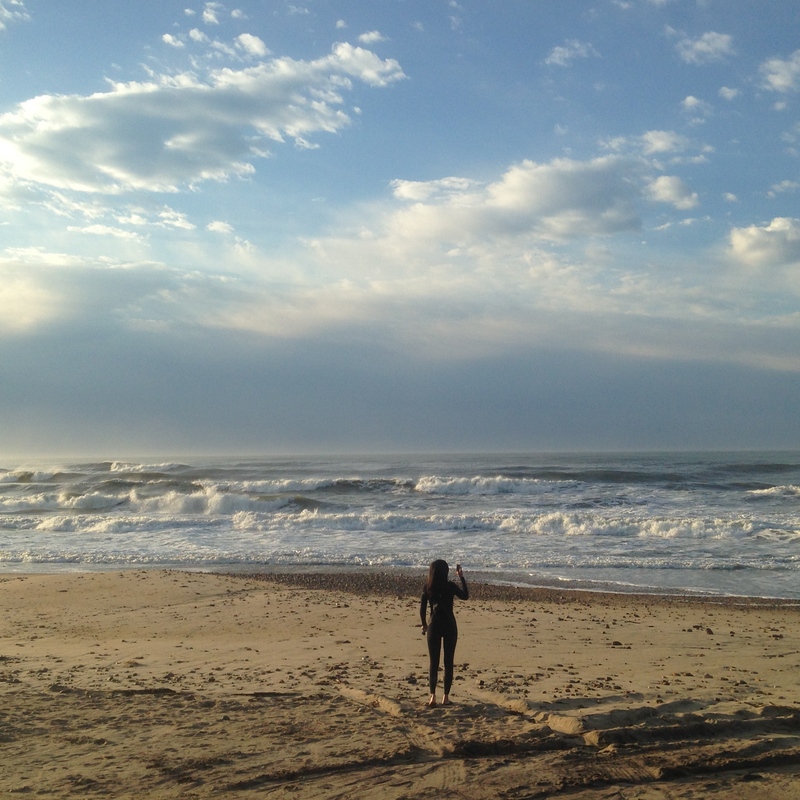 If you’re an East Coast surfer, you must surf at Montauk. 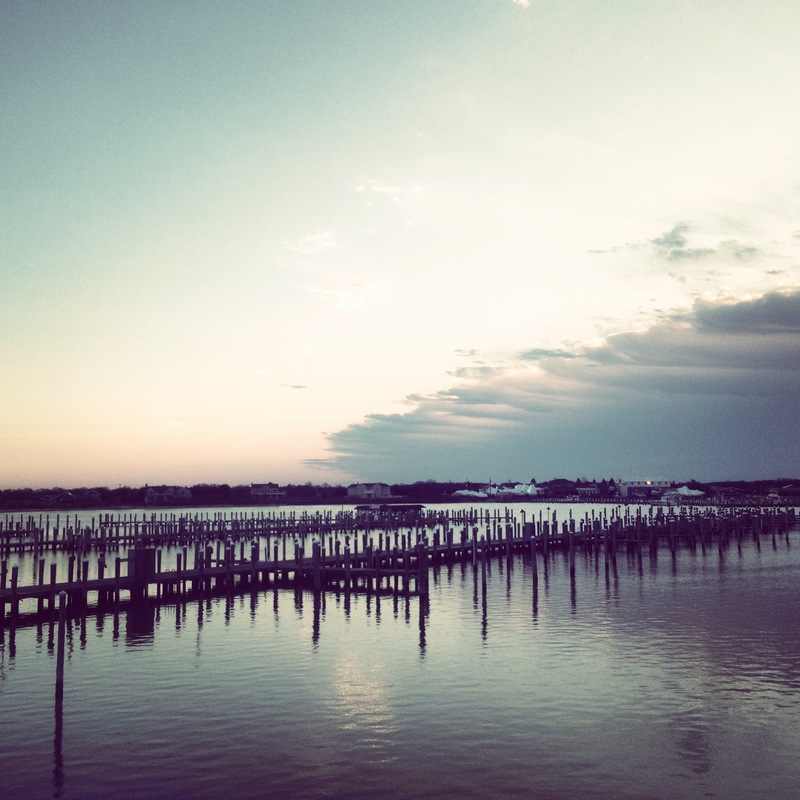 Montauk is situated in the Hamptons, a summer getaway for the rich and famous. 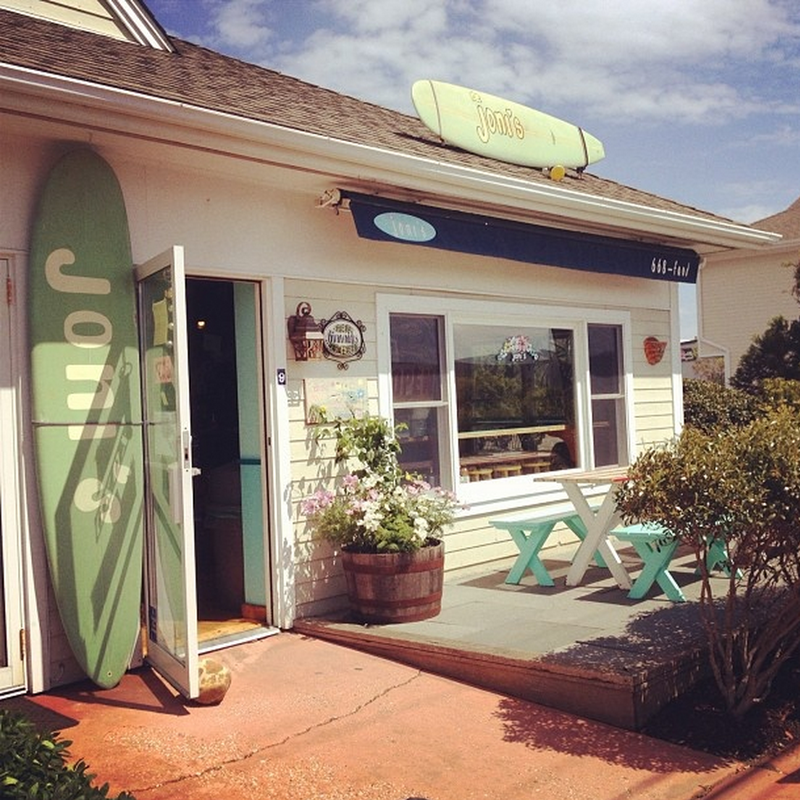 But unlike the rest of the Hamptons, Montauk is a hippie surf village that has a distinct, laid-back vibe. This spring, Surf Mei Mei, PK, and Kelly ventured out to the farthest tip of New York and caught overhead surf with amazing locals. Montauk is a village located at the southern tip of Long Island, New York, along with its famous neighbors as part of the Hamptons. It’s both a fishing and farming town with a long history. 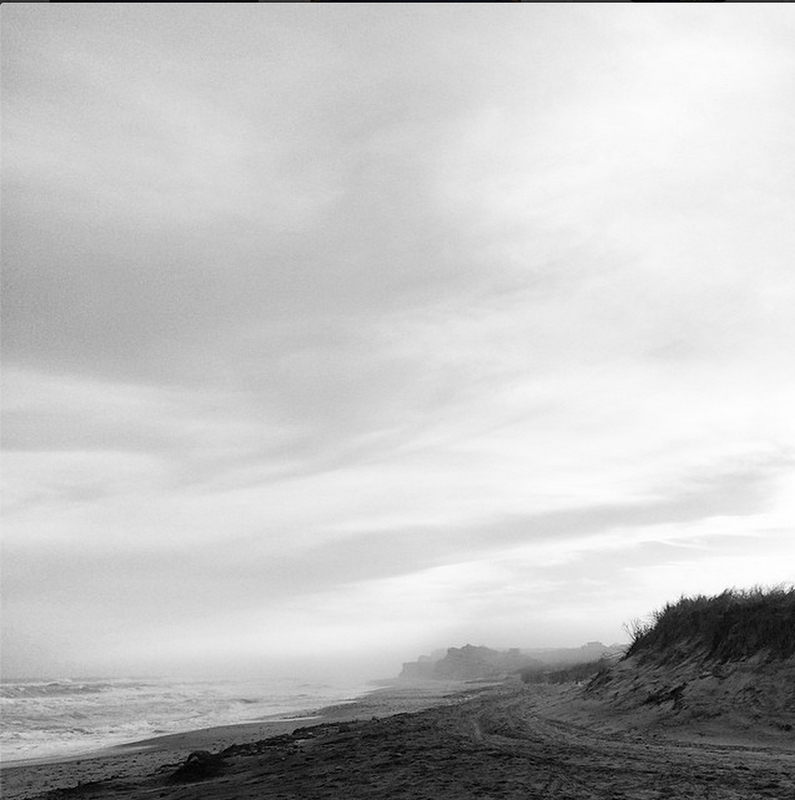 Due its geographic location, Montauk has been an American settlement since the 17th Century. 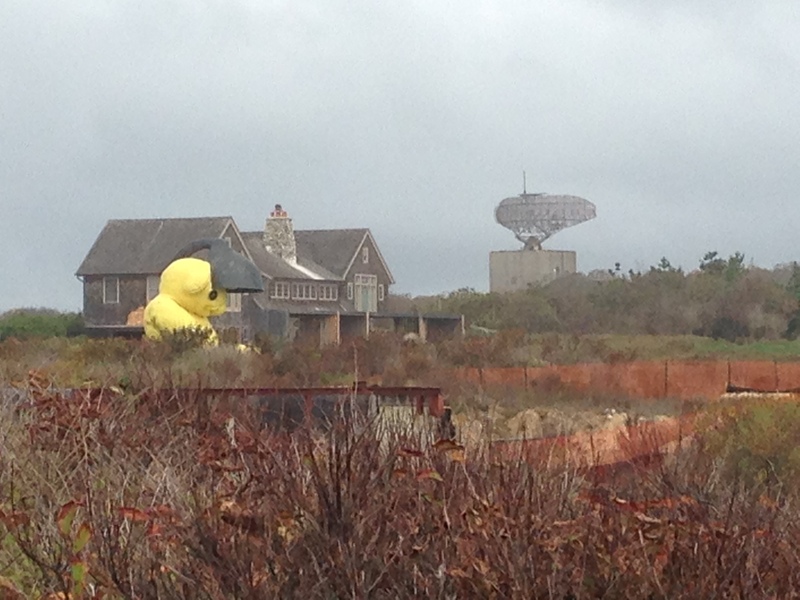 Unlike its rich and swanky neighbors, Montauk attracts creative and eccentric residents year-round. Although quiet most of the year, Montauk becomes a popular summer getaway for New York’s cool kids and hippie surfers, who travel 3 hours from the City to enjoy Montauk’s chill and eclectic culture. 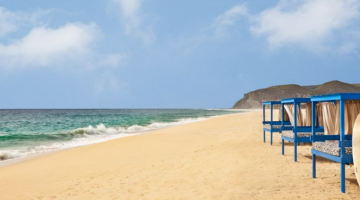 Among its six state parks, Montauk has a great variety of surf breaks, beach points, and reef breaks due to its exposed geographic situation with 100 miles of coastline. 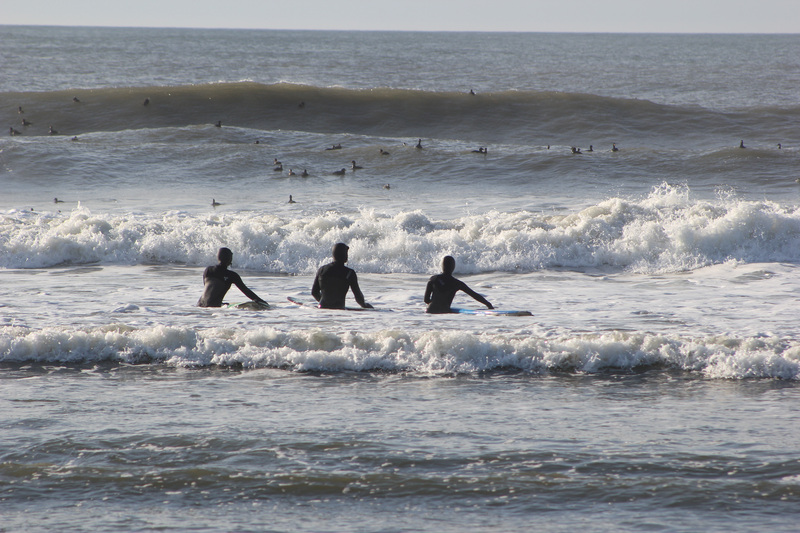 In the winter, its consistency makes it a great year-round surf (if you are down with wetsuit!). 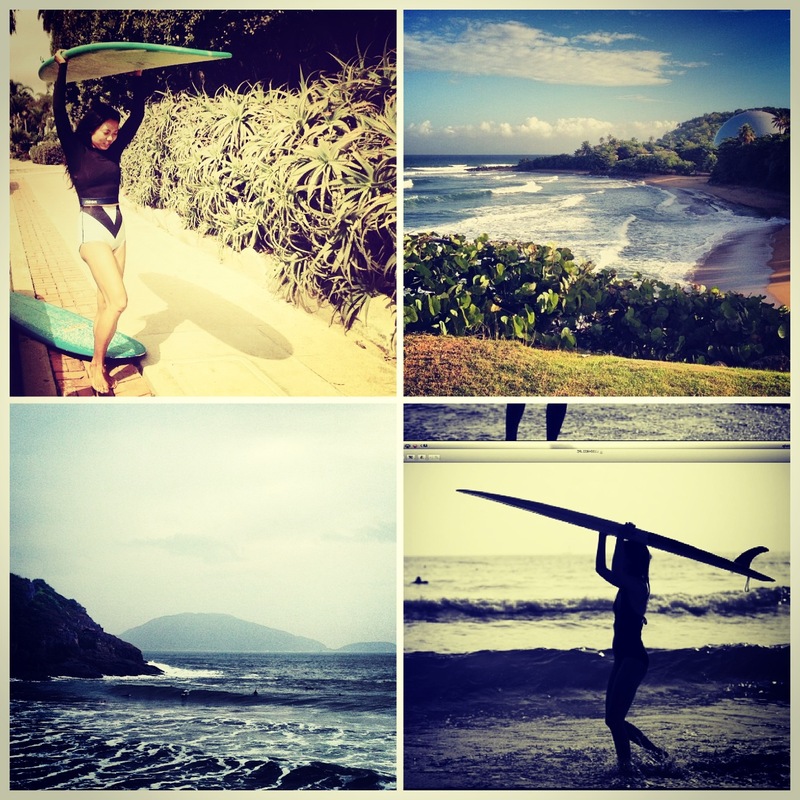 Ditch Plains, the most famous surfing break in the village (entering from Ditch Plains Road) has many surf spots. 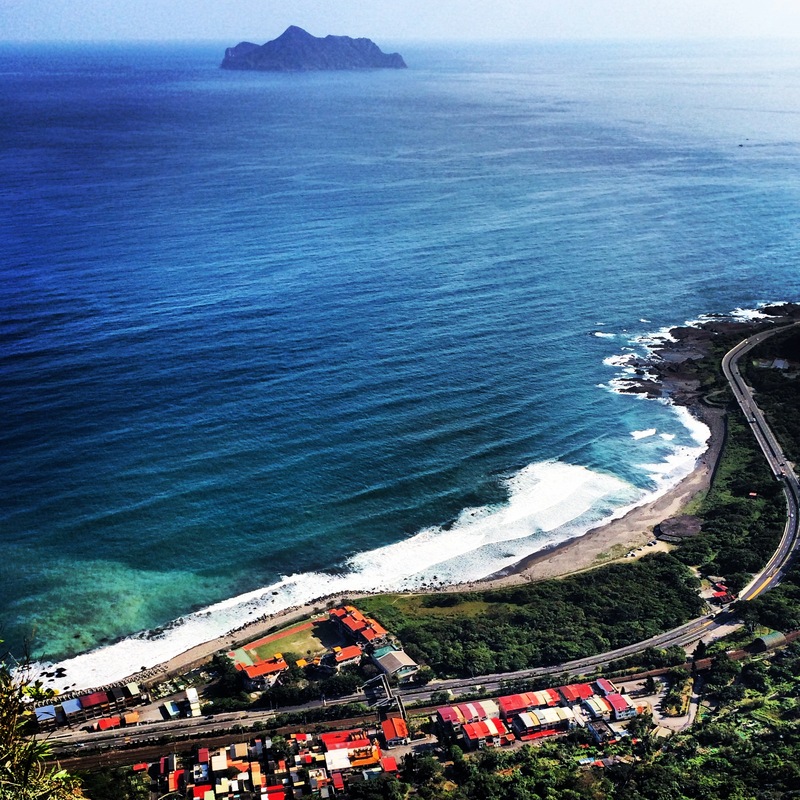 The beaches along the Defroster Road, is famous for long, rolling waves for surfers of all levels. During the fall, the water is warm, with a bit chill in the air. 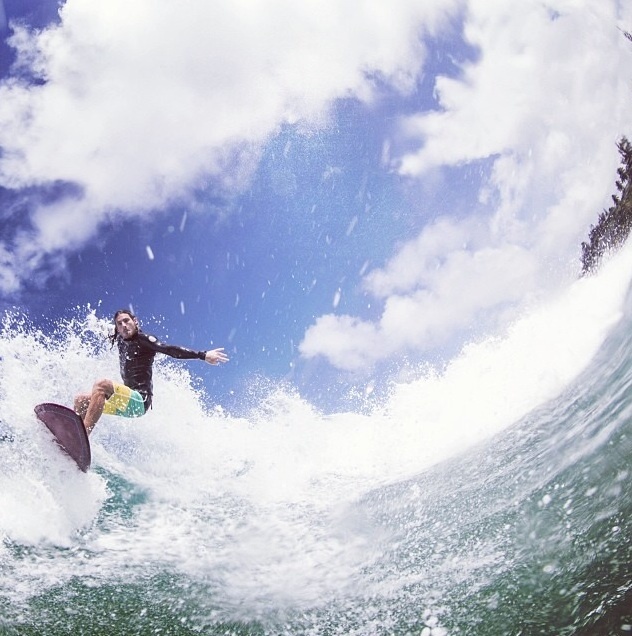 The fall season is many surfers’ favorite season because the summer crowds have gone home. Consistent swell with hurricane season on the East Coast makes fall a great season to visit this cute village. Although it might still be a little crowded on weekends, most of the people are local surfers. Wetsuit: 2mm in September or 3/2 wetsuit + booties and slow moving to 4/3 mm with full gear closer to the winter season. Most consistent ground swell happens at this time in Montauk. If you are happy with 5/4 mm wetsuit, booties and gloves, then this is the best season to go for big and consistent surfing with glassy conditions. Wetsuit: 5/4m wetsuit + booties + gloves, and you might need to put some coconut oil on your face to protect from the windy surfing conditions. Surf Mei Mei experienced the Montauk spring surf season in March. As surfline.com puts it, the weather changes like a moody person. It could be warm one moment, and then the wind picks up the next. We got lucky to surf overhead waves while we were there. 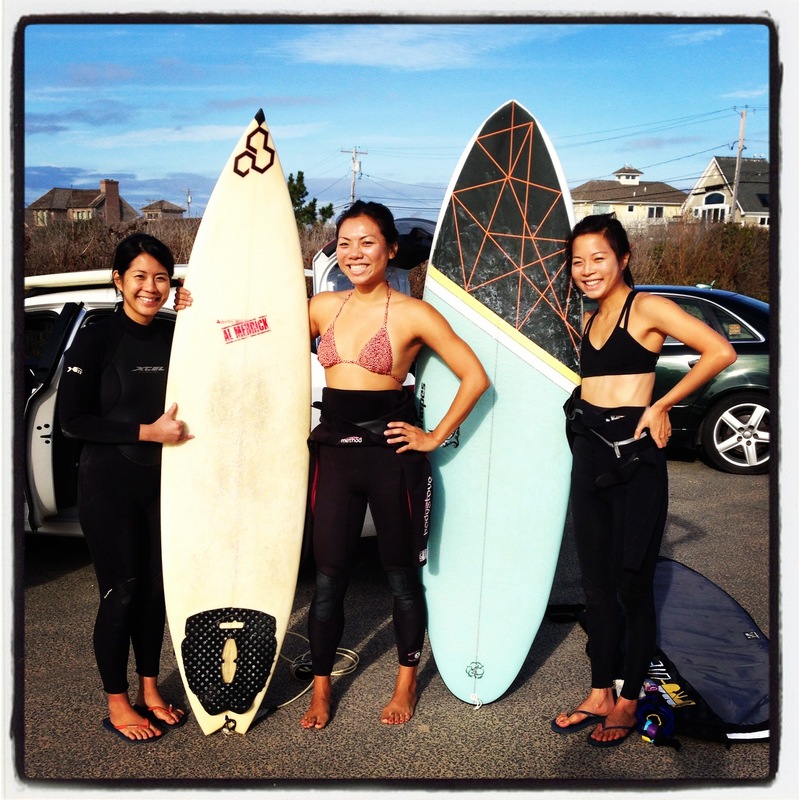 With only three of us in the ocean, we loved Montauk surfing! Wetsuit: 5/4mm with full gear, slowly moving into 4/3mm about April. Great season for beginners! It’s small and gentle but it’s crowded from Memorial Day to Labor Day. Wetsuit: 3/2mm (4/3 sometimes) in June, 2mm full suit in July as the water is still a bit chilly, 2mm vest in August if you want an over hour surf. Once you arrive at Montauk Station, there are many taxis parked next to the train station. Pick one and grab a phone number from the driver. He and other taxis will be your ride for your entire stay. Taxi fare is pretty fair, especially compared with NYC’s. Summer prices can be steep, but you can totally negotiate. We rented a car from downtown NYC for $75 per day with unlimited mileage. Note: There’s only one two-lane road after Long Island Express Way (495), so there’s always traffic. Give yourself an extra 20-30 minutes. MYC is a 35-acre yacht club strategically situated on a tucked away peninsula on Lake Montauk, giving visitors gorgeous view of the waters. The Yacht Club is a convenient 8 to 10 minutes drive to a surfing break on the Atlantic side of the village, allowing people to enjoy both the ocean and the lake. Originally built in 1928 by innovative entrepreneur, Carl Fisher, the clubhouse has a long history closely related to Montauk’s timeline. 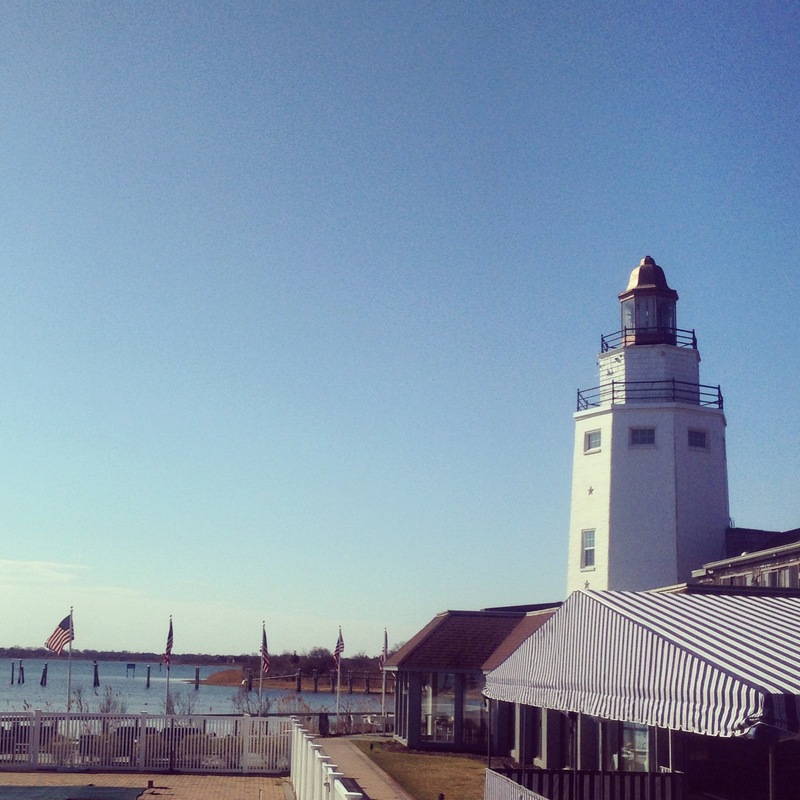 The original Tudor style architecture and a 60-foot replica of the Montauk Lighthouse are some of the landmark attractions at the Montauk Yacht Club. It has become a historical destination for visitors who come in to enjoy water-related sports, nature, and the historical reference. After multimillions dollars spent on renovation in 2009, the Club has been updating its interior architecture in a coastal style to sleek, clean, American design each year. You can find this clubhouse of 107 guest rooms and 23 villas equipped with a full service marina, spa and resort, indoor swimming pool, outdoor tennis court, outdoor lounge and bars, and a fine-dining restaurant (by Chef Robert Reed). MYC also offers seasonal programs and events for surfers, as well as activities likes tand-up paddle boarding, fishing, sailing onsite and offsite. Its longer seasonal service (open from February 15 to thanksgiving, rare in Montauk) to visitors and locals makes the Montauk Yacht Club our first choice to stay in the spring while doing our surfing excursion! Corey’s Wave surf school opens year-round and helps Montauk Yacht Club with its surfing visitors. 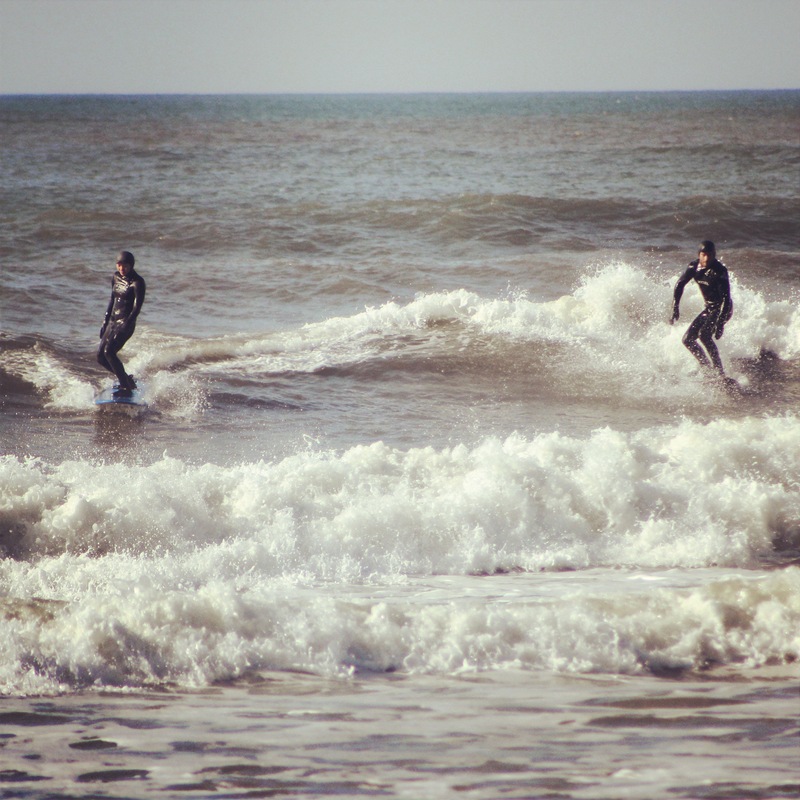 Mostly for beginners, its instructors can also surf guide with intermediate and advanced levels, as their instructors are Montauk’s very own local surfers. Surf Mei Mei always loved Joni’s for hanging out and fueling up. Beside our favorite Thai Me Up wrap, Joni’s has great smoothies for a quick re-fuel. If you have the room in your tummy, don’t forget to snack on its in-house pastry, like brownies! Catch: Can be crowded here with long lines and small section of seating area in the restaurant. Be patient; give the servers a big smile. While chatting with other diners on the communal table, enjoy the cute environment and yummy organic food! This lighthouse has a lot history: it’s not only the very first lighthouse to be built in New York state, but actually New York state’s first pubic project. 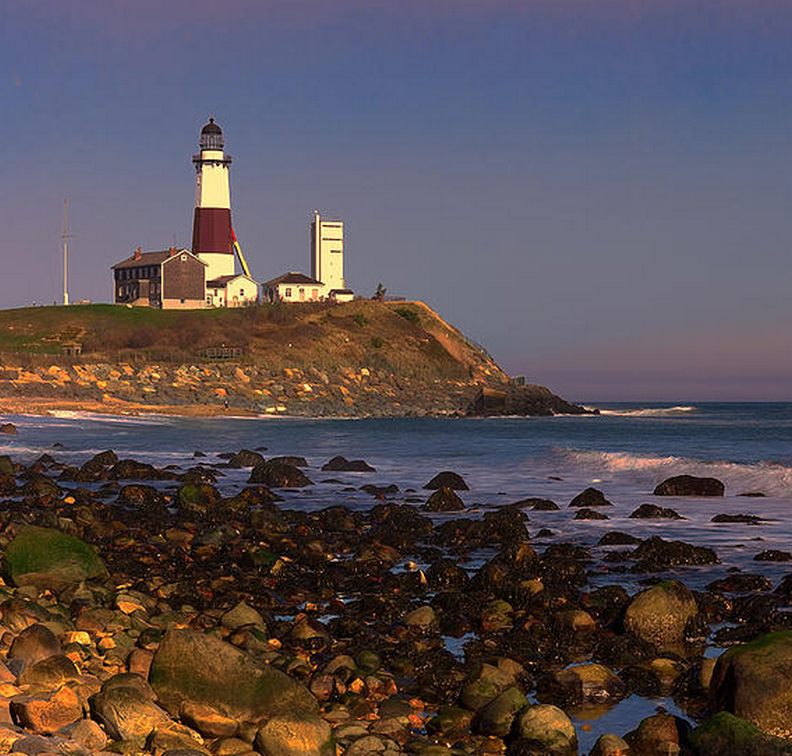 Built in 1797, is the Montauk Lighthouse is a National Historical Landmark, now one of the most visited sites on Long Island, and one of the best places to check our surfing condition (sorry, everything involves surfing). Enjoy the view of the beautiful Montauk coastline. Location: Off Ditch Plains Road, there are a few entrances to Ditch Plain Beach. The second right turn, with a large parking area, is the popular entrance. It has a public bathroom and outdoor shower area. Best Season: Late summer/early fall for hurricane swells, but winter fires with consistent large swells. Wave Quality: Very consistent reef/point break that is a great longboard spot. Not overly powerful, just a fun long ride. Skill Level: All levels. Perfect for beginners. 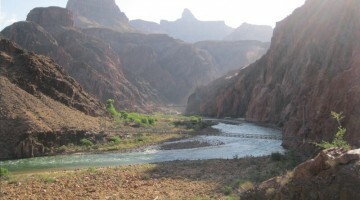 Note: This popular spot can get dangerous in the summer and warm-weather weekends. Gets crowded with long boarders and tons of beginners. But the beach has very mellow feel. A long and easy paddle out in the summer or when conditions are good. Watch out for the rocky entrance. Surprisingly, this casual and laid-back seafood diner by a marina has fresh and gourmet seafood. Our bartender at Barracuda Bar of MYC described this place as “a yummy but basic restaurant that is inexpensive and loved by locals.” She was right. The owner, the ex-chef at Gurney’s Resort Montauk, was a gentleman who recommended our favorite dish, One and Only Lobster Burger. If you do not care about fancy dining environment, come to Sammy’s. 8:30pm to 9:30pm: Get your drink on! Or just chill. 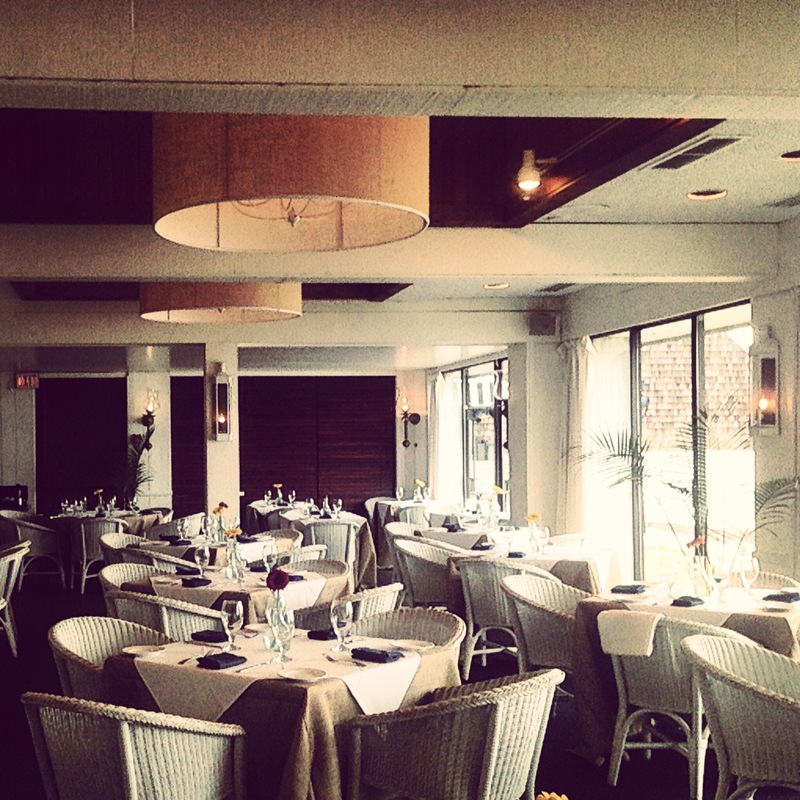 Where else is better than the waterfront view at the Promenade bar and lounge at Montauk Yacht Club! You can chat in the intimate environment with your friends and family while enjoying the quiet view of the Lake. 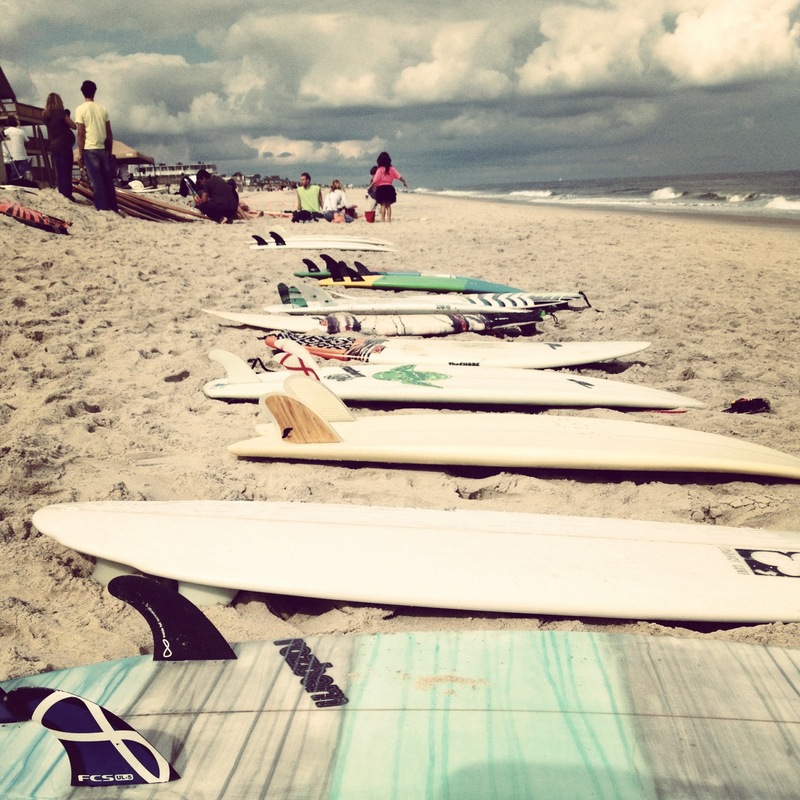 Or there are many other more advanced surf spots all around Montauk. Please make sure your surfing skill is suitable for each break. 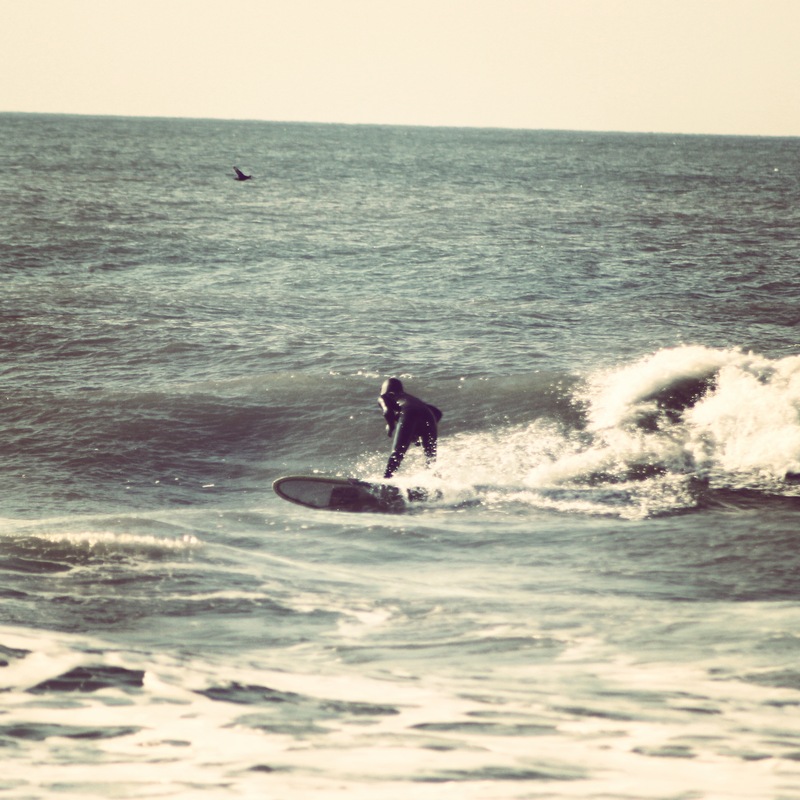 Many of Montauk surf breaks are hidden and typically used by locals surfers. Respect locals and be safe! 9:30am to 10:30am: Shower and Check Out! Another place that we loved! 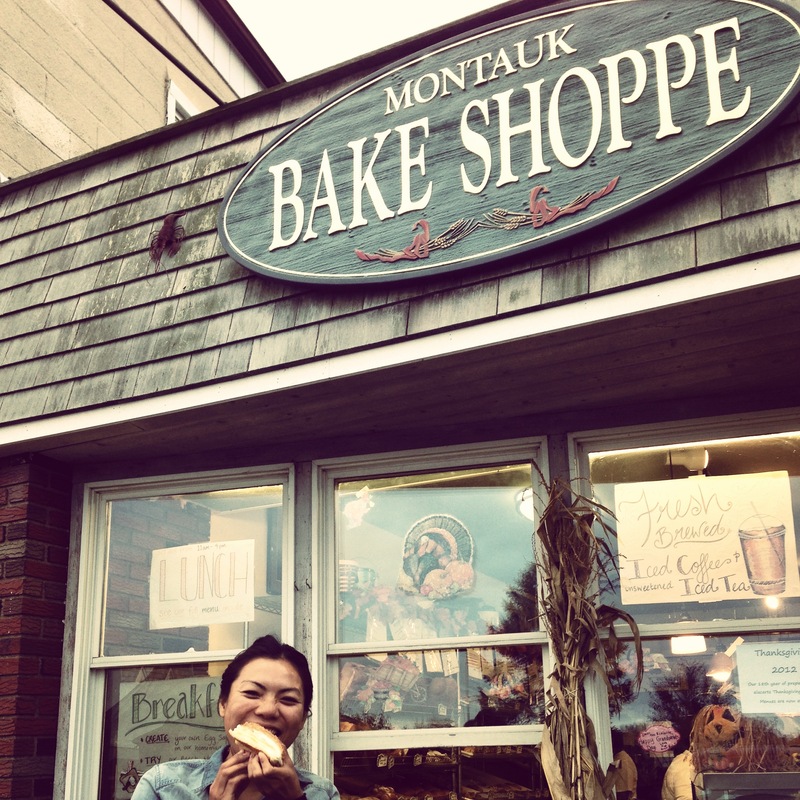 Montauk Bake Shoppe has one of the best veggie wraps we ever had, with yummy avocado and variety of vegetables, making it a perfect post-surf meal! The bakery also has a long history. Don’t forget to get a cute mug and some of its famous jam! Before our first trip to Montauk years ago, many of our friends recommended Air & Speed if we needed anything for surfing. The shop is has a laid-back vibe with a great mixture of boutique, mainstream, and their own brand of products. They also have a selection of used longboards for sale with good prices. Instead of renting a board, our friend bought a used one right before our surf trip. 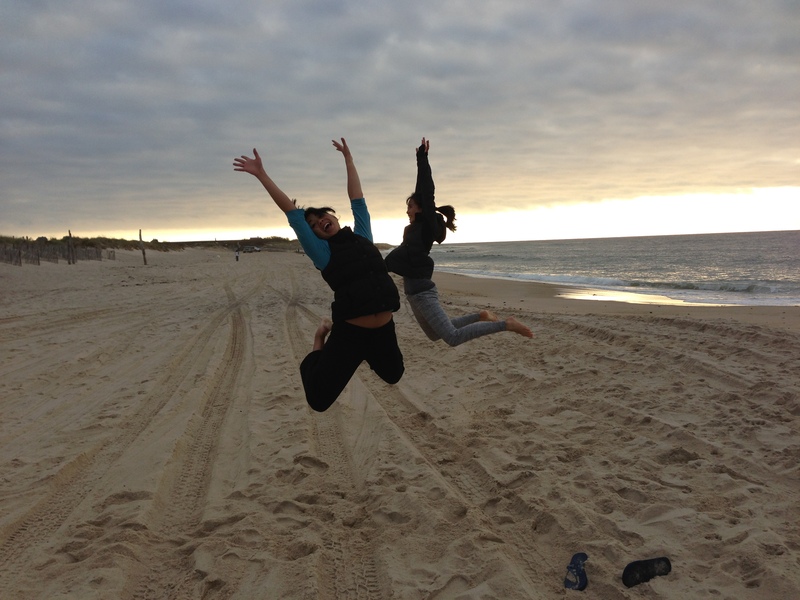 12:00 and onwards—Bye Bye, Montauk! 24 hours might seem short, but it was the perfect length for our busy schedule ahead of us in NYC. If you East Coast surfers who want to experience the laid-back and artistic side of the Hamptons, but you don’t have much time, you should take a short trip and enjoy Montauk’s local hospitality! 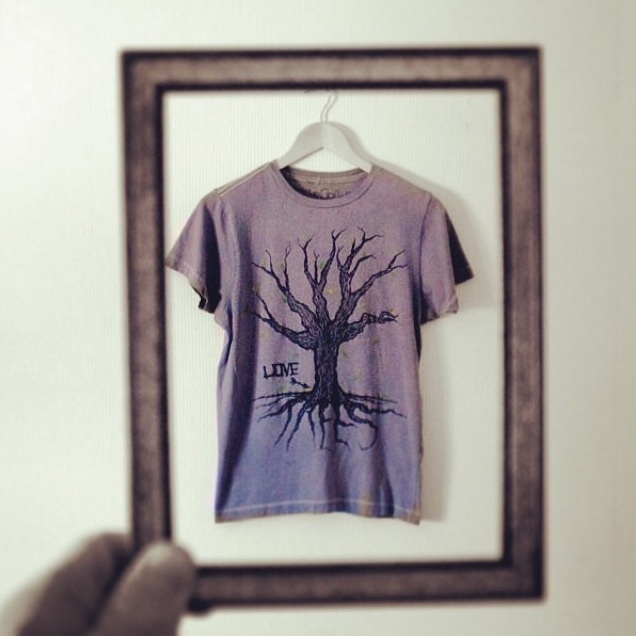 Follow Chris’ suggestion to enjoy the true Montauk’s scene, and go to his Etsy shop, Live in Color. 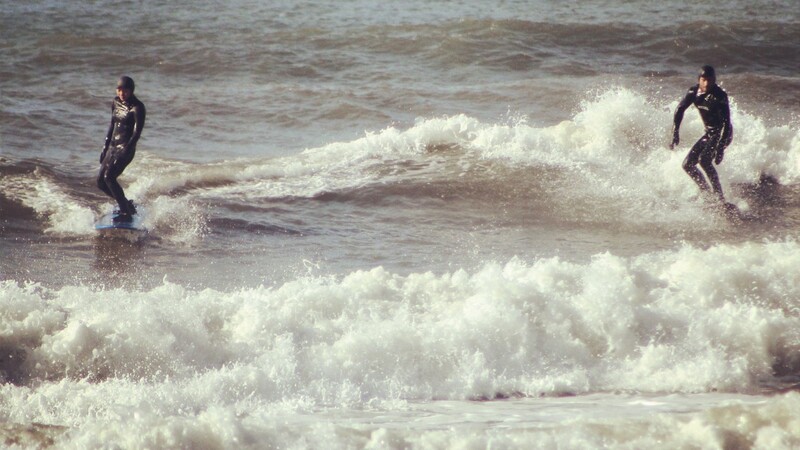 Well I’m a surfer and a sailor, so the ocean calls me wherever I go. There’s a few good places to watch the water from. If you park at shadmoor state park you can take a 10 min walk to the ocean. When you arrive you find yourself on top of the cliffs overlooking ditch plains. I love this spot because it really gives you a birds eye perspective on a couple of the local surf breaks and helps you understand what kind Of swell gets those places cranking. 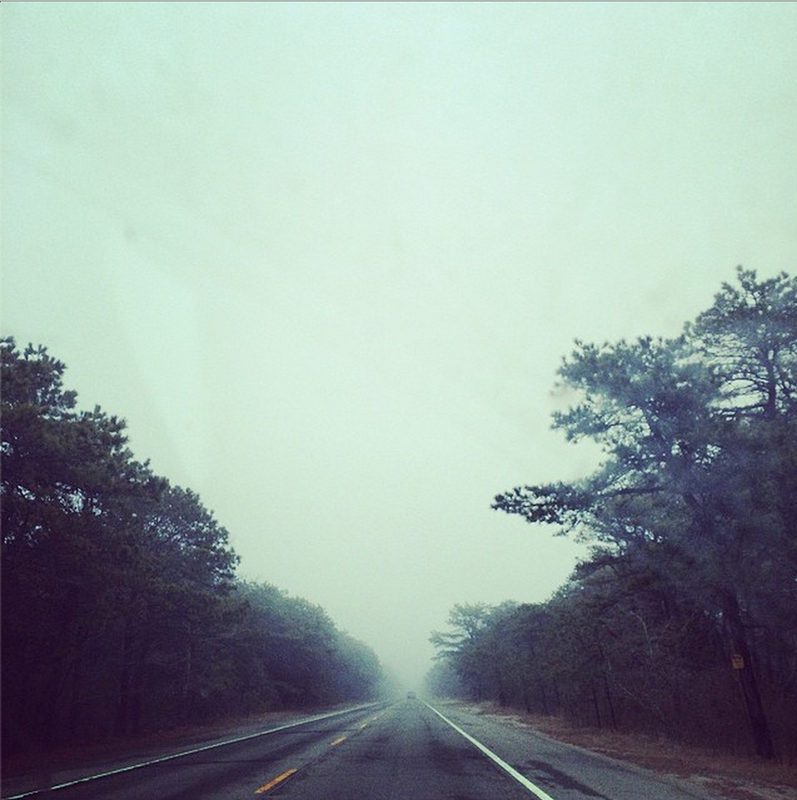 Driving east, you’ll arrive at the eastern most point of Long Island where the lighthouse stands. Here you can really appreciate how Montauk is geographically so much more dynamic and rugged than the rest of the south shore. From cove to cove the land turns 180 degrees from south facing to north, giving a surfer a diverse range of spots to choose from depending on conditions. As a sailor it represents a challenge. A headland to round which can be difficult in a small vessel where you need to make certain you are traveling with the tide as well as the wind. It’s hard to choose my favorite places to eat since there are so many choices and everything is outstanding quality. A few that come to mind: Montauket for a cocktail and sunset, Zum Schneider for quality beer, Westlake fish house for sushi, Swallow East for music, Navy Beach for dinner, and the Gig Shack is a good place to meet up w everyone before you kick it all off. Those are just some of my favorites, but be confident when choosing; there are plenty more options and they’re all good. 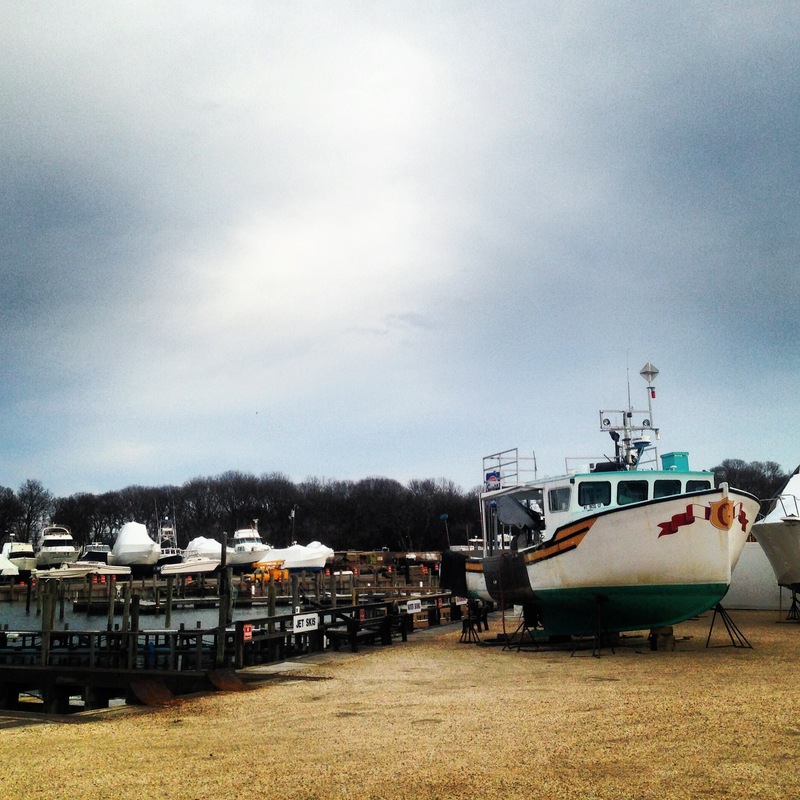 Head to the harbor to watch the boats coming and leaving the inlet or wander around camp hero. Best tip of all ? Come during the spring or fall when the crowds are minimal, waves are great, and weather is changing and dynamic. Previous post Recipe: Summer Ice "Treat"